More & more people are opening up and becoming creative beings on social media. Facebook, Instagram, Twitter & YouTube are all video capable platforms that seem to be consistently evolving every other month. With this evolution, comes wanting an upgrade for the content you put out onto the World Wide Web. I have been actively producing content on YouTube for 2 years now and I’ve stepped my visual game up. I’ve done this, simply, by just playing around with my camera, doing research within the YouTube community, and using Google to find different tips and tricks. In this blog, I’ll be sharing tips and references that will help you achieve the level of high quality videos you are shooting for. So, let’s start with the biggest and maybe, most expensive, contribution. The recording equipment. When I first began filming for my Youtube content, I used my Fiancé’s DSLR, Cannon T3i with the manufacturers lens. At the time, it was perfect for me because I knew how to get it to record, stop recording and that’s it. I never gave much thought into any of the other settings because, to be honest, it was just too many buttons to press and I would get lost. Recording went well but the camera was heavy and bulky, and it wasn’t mine, so sharing would sometimes get in the way. Last year I was on the hunt for my very own light weight camera that had great recording skills and ok picture skills. 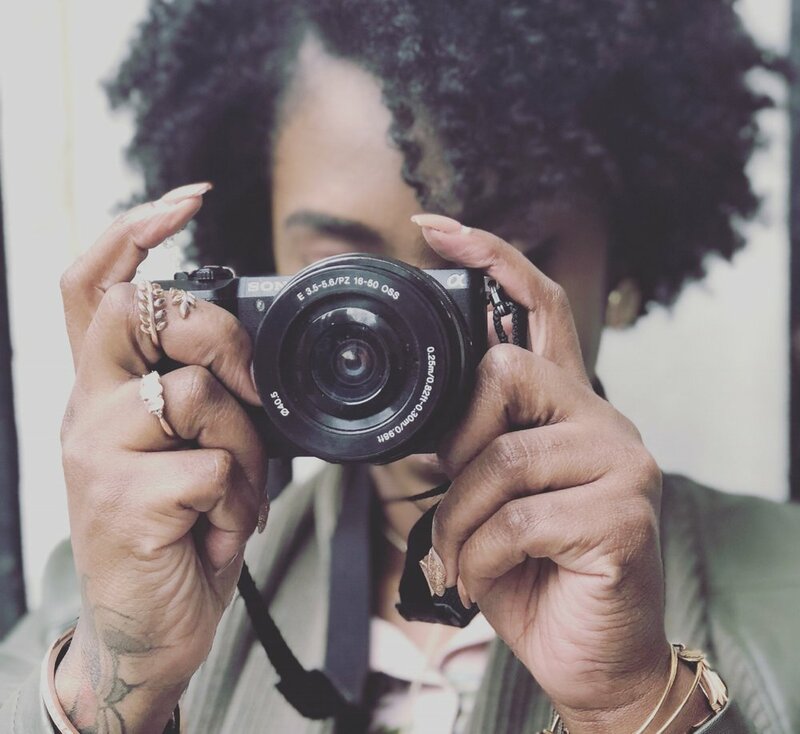 I inboxed a few of my favorite Youtubers (Shout Out to Nae2Curly & DayeLaSoul!) and asked them what they were using. Surprisingly, they were both using the Sony a5100. After looking up several reviews and demos, I was sold. The Sony a5100 was deemed the best vlogging camera out, and as soon as I could, I shelled out the $400+ to get my own. (I actually got it on sale at Best Buy.) I can truly say, that after almost a year, it’s held up to its name. Since my purchase, I have also acquired a new lens. It is a Sony 35mm 1.8 that shoots clearer and tighter stills and video. These were such great investments! If you’re just starting out and using your phone, remember, there’s absolutely no problem with that. A lot of newer phones like iPhone (anything + or up) and Samsung Galaxy s9 have some of the best quality picture and recording hardware so I’ll make sure to mention those in the post too. Like I said before, camera settings are foreign to me because it can be so confusing. After doing some research I’ve found that there are only a few setting changes you really need to get some good quality footage. The link that I am referencing below is for the Sony a5100 family. I started the video on the most important part of the camera settings that will give you a better quality while filming. Now, are these settings great for any camera? I have no clue. I, personally, left some setting changes alone based on the amount of light available while I’m recording. Use your own discretion with these settings based on the factors of your recording space. Remember these terms and use them to your advantage. Aperture, Shutter speed and ISO. Shutter speed goes more towards taking stills but with aperture and ISO you’ll have cleaner and crisper footage when filming. If you’re using your cellphone to record, then this portion of the settings are for you. I currently own an iPhone 8+. If you didn’t know, any of the “Plus” iPhones, and all iPhones manufactured after the 8+ have an amazing portrait mode for still pictures. I’ve taken a lot of the pics that you see on my feed with this mode on my phone. I edit with Lightroom, and the outcome looks like I used a heavy duty, expensive DSLR camera. With video you can get the same quality as a camera and lens just by changing your phone’s recording settings. Now keep in mind that I do not own a Samsung, so the setting arrangements may vary, but you’ll get an idea of how you should go about changing your settings with these step-by-step instructions I used on my iPhone 8+. This video recording setting puts your footage in HD. It transfers over to iMovie or any other editing tool without compressing or distorting. Keep in mind that because you are now increasing your frames per second, it creates larger files. This means more space is being used. If you’re like me and you record, transfer then delete, you’ll have nothing to worry about when it comes to phone storage. Now I’m no expert at photography and film, but playing around with my ISO and Aperture while my camera is in “PROGRAM AUTO” mode has worked the best with filming my content and even taking pictures. Those terms fall under the exposure category. Once you understand exposure, you’ll learn that lighting is a HUGE factor in helping create amazingly clear and clean videos. The link below broke down exposure in a way that was so simplistic, I could understand it. Even though the creator uses a Cannon in the video, it crossed over easily to my Sony because most cameras come with these basic settings. The absolute best way to get the highest quality video is by improving your lighting. This was something that I lacked in the beginning. My recording space was my bedroom which only had one window that I inconveniently had darkening curtains on (I worked nights and slept during the day). Even with me opening them up, the way my old apartment faced, natural lighting had a very hard time shining through. This is when I decided to invest in a ring light. 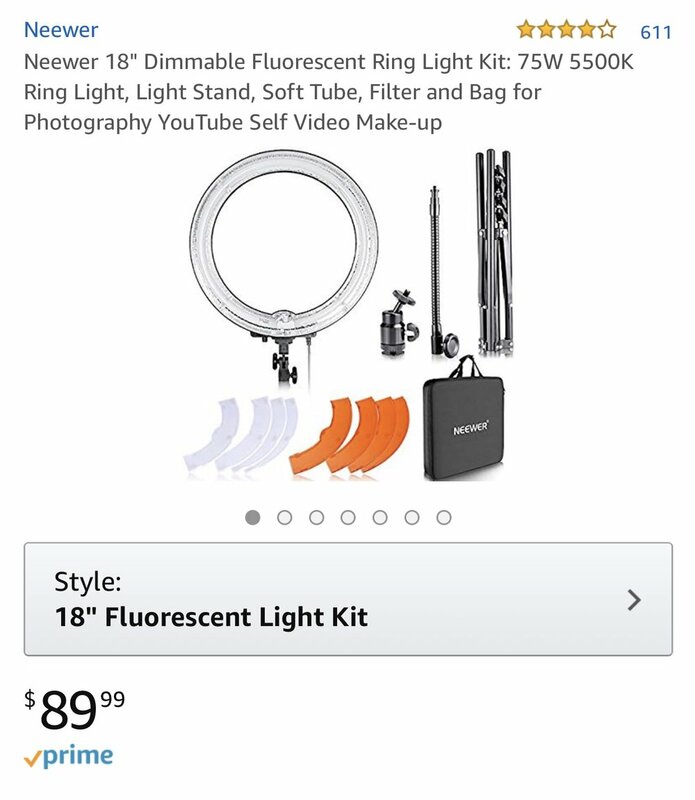 2 years ago I searched for the best ring light for YouTubing that was easy on the pockets, and I came across the Neewer Dimmable 18” ring light on Amazon. Around that time I spent a little over $150 for the light, but now it’s priced at 90 bucks! Balling on an extreme budget? The cheapest and most flattering light you can use is natural sun light. Setting up your recording space directly in front of your window would be the best way to go. My recording space is now in my living room, with a beautiful color back drop or styled background and surrounded by natural light from two big windows. Are you looking for something with a little more quality that you don’t mind dropping a little coin on? Adding soft boxes to your lighting equipment may be the addition you need, along with your ring light. A continuous soft box is an enclosure around a bulb consisting of reflective side and back walls and a diffusing material at the front of the light. What this does for a videographer is create a large source of diffused light to shine on the subject. In use, this means that the quality of light is softer, resulting in less contrast and hard shadows. Soft boxes are priced on Amazon ranging from mid $50 up to, and over, $150 for a pair. With any type of filming equipment you should also search in online market places like Facebook and Craig’s List. There are other ways to get some pretty good lighting for free, on a budget or if you’re not comfortable with expanding your equipment. The quick video linked below will gather you all together, from what bulb to shop for with household lighting and back lights, to manipulating your lighting with positioning. Small additions, like light reflectors, also make a big difference. This is a great tool to control the light you have around you even if it’s limited to window light. Photography collapsible light reflectors can be found at your local Best Buy for a little over $20. If that doesn’t seem like something worth dropping a dub over, take a look at this cost efficient reflector used in the studio of a fellow YouTuber. Since I don’t have a private studio space to record my videos, those reflectors wouldn’t be a good fit. Although, with that price, I would definitely consider it. When editing my videos I use iMovie on my MacBook Pro. iMovie is free and has been doing well for me since I have started editing my content and I don’t plan on moving to any other existing software just yet. If it ain’t broke, don’t fix it. With any editing system, you have options on the resolution quality when uploading to your channel, dropbox or hardware storage. The resolution format I use is HD 1080p when uploading. This format gives your content a HD quality and a better look, but will take up more storage space. Having an external storage device comes in handy with uploads like these. One more tool you might want to invest in when wanting to upgrade your video content is the actual storage disk you use in you camera. I’m sure most of you just go out and buy any ScanDisk card available, but those little cards can make a world of a difference with recording. The ScanDisk Ultra SDXC 64GB is what I now use when recording all of my video footage. This storage disk should go on your list of things to purchase. As you change your settings on your camera, the writing speed of what you record and transfer to the disk will slow down. This high speed SD card will ensure that it wont take nearly as much time, and the quality, of course, will be 10X better. I hope that this blog post helps answer some of the questions I get on Instagram and Facebook about how I leveled up my video quality. It takes a bit of time and research and maybe some money spent, but as a growing and budding creative, it is so worth it! If you have any more tips you’d like to add please feel free to leave them in the comments section.